Each dog tag on this page is licensed by the United States Department of Defense for the 50th Anniversary of the Korean War Commemoration to honor the Military Units that fought in Korea between 1950 and 1953. 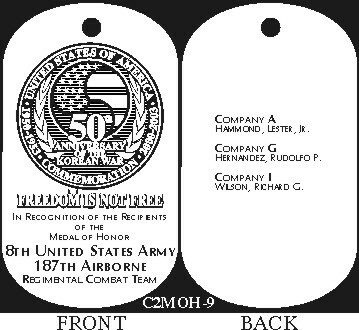 Dog tags on this page may be ordered individually from the address on the Products Home Page, in quantity by e-mailing us or through the GSA contract #GS-07F-0335K price schedule. Each tag is printed with epoxy on quality aluminum, 32 mils thick, and comes with a 30" nickel-plated steel ball chain attached. See the 50th Anniversary of the Korean War Commemoration Hall of Honor for the individual citation of each Medal of Honor recipient listed on the 2nd Infantry dog tag. 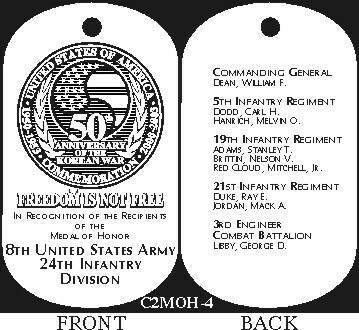 See the 50th Anniversary of the Korean War Commemoration Hall of Honor for the individual citation of each Medal of Honor recipient listed on the 3rd Infantry dog tag. 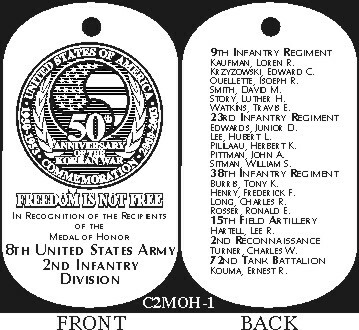 See the 50th Anniversary of the Korean War Commemoration Hall of Honor for the individual citation of each Medal of Honor recipient listed on the 7th Infantry dog tag. See the 50th Anniversary of the Korean War Commemoration Hall of Honor for the individual citation of each Medal of Honor recipient listed on the 24th Infantry dog tag. 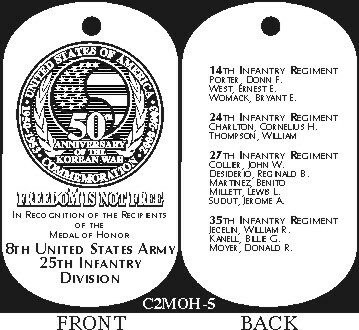 See the 50th Anniversary of the Korean War Commemoration Hall of Honor for the individual citation of each Medal of Honor recipient listed on the 25th Infantry dog tag. 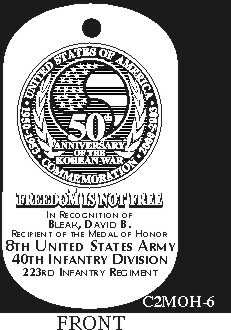 See the 50th Anniversary of the Korean War Commemoration Hall of Honor for the individual citation of each Medal of Honor recipient listed on the 40th Infantry dog tag. 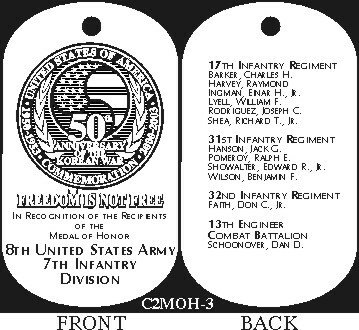 See the 50th Anniversary of the Korean War Commemoration Hall of Honor for the individual citation of each Medal of Honor recipient listed on the 45th Infantry dog tag. 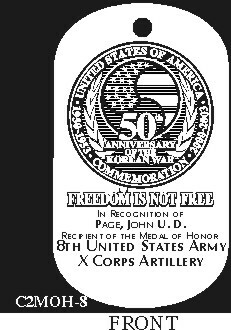 See the 50th Anniversary of the Korean War Commemoration Hall of Honor for the individual citation of each Medal of Honor recipient listed on the X Corps dog tag. See the 50th Anniversary of the Korean War Commemoration Hall of Honor for the individual citation of each Medal of Honor recipient listed on the 187th Airborne dog tag. See the 50th Anniversary of the Korean War Commemoration Hall of Honor for the individual citation of each Medal of Honor recipient listed on the 1st Cavalry dog tag. See the 50th Anniversary of the Korean War Commemoration Hall of Honor for the individual citation of each Medal of Honor recipient listed on the 1st Marines dog tag. 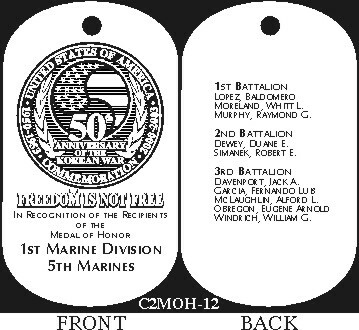 See the 50th Anniversary of the Korean War Commemoration Hall of Honor for the individual citation of each Medal of Honor recipient listed on the 5th Marines dog tag. See the 50th Anniversary of the Korean War Commemoration Hall of Honor for the individual citation of each Medal of Honor recipient listed on the 7th Marines dog tag. 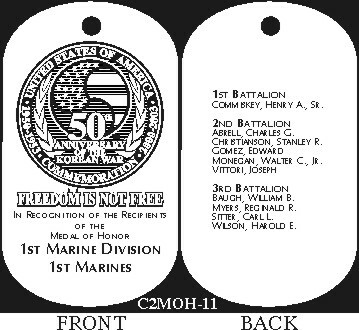 See the 50th Anniversary of the Korean War Commemoration Hall of Honor for the individual citation of each Medal of Honor recipient listed on the 11th Marines dog tag. See the 50th Anniversary of the Korean War Commemoration Hall of Honor for the individual citation of each Medal of Honor recipient listed on the Navy dog tag. See the 50th Anniversary of the Korean War Commemoration Hall of Honor for the individual citation of each Medal of Honor recipient listed on the Air Force dog tag.